"I also want to point out that youngsters need to be pushed in order for their bodies to respond to the stimulus of lifting weights. I've been to clinics where all the youngsters had in the way of weights were broomsticks or PVC pipes. Either of these are useful for warming up and drilling as part of the warm-up, but when they get into an exercise, put some weight on the bar. A broomstick or plastic pipe will not act like a weighted barbell so what is being learned with the light resistance doesn't relate at all to doing a full squat, power clean, or press." I like it. I will show it to my dad, so he knows what's good for his grandkids. Also for himself, as he has set an arbitrary maximum limit on what he should be lifting. I keep telling him, just add 1 more pound to the bar, don't worry. Good Article, and I'd love to see a part III the helps outline specifics of equipment to use for the wee ones. My kids are little but crazy into Gymnastics. They'd do anything to get better. Yet, An Olympic bar would crush her, so how do I handle that? I'm also curious about pausing at the bottom of the squat, but I'll re watch the DVD before posting a question. Thank you for posting this article as it's a great compliment to the first part. It goes much more in depth on how to train kids physically, as well as mentally. I hope we can eventually look forward to more of these type of articles, becuse our kids are the future. Great article. Maybe some more programming advice specific to youngsters! Great work! This is a fabulous and useful article. Thanks, Bill! My kids are little but crazy into Gymnastics. They'd do anything to get better. Yet, An Olympic bar would crush her, so how do I handle that? BrewinBombers, my four year old and six year old lift with a 5 kg aluminum training bar. They have those cheap "standard bars" at wal-mart that are for the weights with the 1 inch hole. I think they only weigh like 10-15 pounds-I think one of the sets with about 90-100 pounds is like 70 bucks. once they grow out of that then they would be ready for using the larger bar. 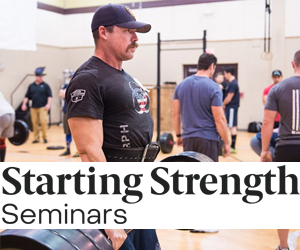 Its Grant from Gorilla Pit workshop, at the end of the article they say to ask for more, well this is a big part of what I do, meaning train kids from 10-18, I use these articles to provide parents with a positive reference on strength training for youngsters, so can we get some more positive info on this topic if it exist????? Thanks for all that you do to promote strength training, i really appreciate it!!! Yet, An Olympic bar would crush her, so how do I handle that? I made a light bar from 1 1/4" pine dowel (oak or maple 1" dowel would be better, but HomeDepot didn't have any). I added 2" PVC Pipe to the ends, filled with epoxy and quartered PVC. The PVC is a bit small for my spring clamps so I drilled a few holes for spring pins to hold the weights, but other clamps might work fine. It holds 42.5 pounds just fine, and goes 2.5 pounds stripped. Curious - Bill noted that he doesn't allow his young trainees to rebound out of the bottom on a squat - is this specifically while they are learning the movement or how he expects people to squat generally?